Vermont Yankee energy was replaced by natural gas. That's the bottom line. During the first three quarters of 2014, (January through September) Vermont Yankee was running. During the first three quarters of of 2015, it had shut down. Scott Luft writes the ColdAir blog, which is mostly concerned with Canadian energy issues. http://coldair.luftonline.net. However, in early December, Luft tweeted some comparisons of energy sources in the Northeastern U.S., before and after Vermont Yankee shut down. Similar charts are below. First look at the top chart--the nine-month comparisons. About 1500 GWh more electricity was produced in the first nine months of 2015 than in the first nine months of 2014 (see the "all fuels" line). Almost all of the change in electricity (top chart) was produced by an expansion of the use of natural gas, making up for the drop in nuclear and coal. There was also an expansion of utility-scale photovoltaic energy, but the vast majority of the change in power supply was expanded use of natural gas. One anti-nuclear commentator challenged these results, saying that looking at the first three quarters was a clever way to cherry pick data and avoid the true story of what really happened. 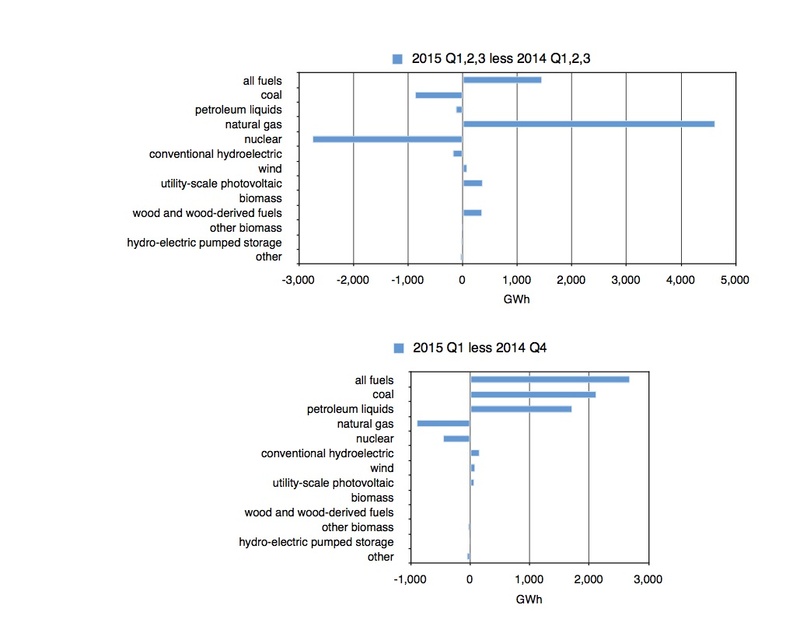 Nuclear and natural gas use both fell between the last quarter of 2014 and the first quarter of 2015. And indeed, they both did (second chart). This wasn't anything to be proud of, however. The first quarter of the year is quite cold in the Northeast, and people use natural gas to heat their homes. Therefore, many natural gas-fired power plants cannot obtain fuel. Oil and coal take up the slack. Nowadays, natural gas plants are equipping themselves to be dual-fired, so they can burn oil. Nuclear went down, natural gas wasn't available, and oil and coal use went up. Nothing to celebrate. We're not looking at "green" energy expanding. You can double-click to expand the charts. After I saw Luft's tweet, I contacted Scott Luft and asked him about his sources. Luft very kindly re-produced his sources and spreadsheets. Luft's information came from several queries to the EIA data browser. Luft had pulled the information into spreadsheets. Later, my husband George pulled the same data into the Macintosh spreadsheet that he likes better. Then he made the charts from the data. The data from his spreadsheets is shown below. It is all based on queries to this EIA database. Deepest appreciation to Scott Luft and George Angwin. Also, Scott Luft compiled a "storify" of his twitter interchange with Mark Z. Jacobson on this subject. In my opinion, Jacobson comes off badly in the exchange. It doesn't take complex work to show the flaws in Jacobson's arguments. You simply start with quoting him directly, and the facts take it from there. "Nuclear went down, natural gas wasn't available, and oil and coal use went up. Nothing to celebrate. We're not looking at "green" energy expanding." Absolutely yes. And that's just electricity. Natgas use did go up, for exactly the reason you mention -- it was cold. Vermont is the same as Ontario, and the Ontario energy peak is, and always has been, in winter -- electricity is in long third place, behind heat (#1) and transportation (#2). My bet is that natural gas use actually skyrocketed in Vermont during Q4 2014 and Q1 2015, by much more than the amount the graph shows it decreased in electricity generation. If Jacobson's fantasies had any basis in reality, wind/solar would have picked up ALL VY's slack, and would have provided a hundred-or-so million MWh for heating to boot. No need for any of that gas. But alas, his fantasies share no correspondence with reality. The graph shows wind and solar were negligible, and did nothing to mitigate fossil use IN ELECTRICITY, forget about heat and transportation. Thanks for that hard-worked graph I'm studying -- like every legislator ought!! Have a Happy New Year & Keep the Flame!! "Quebec shut it's nuclear generating station late in 2012. It is be possible to find sales from Canada to Vermont via Canada's National Energy board: YTD October exports to Vermont from Canada, mostly Quebec, show as up just 214 GWh (2015 over 2014) - but the price was up over 10% (nearing $70/MWh)." Steve, Jacobson believes in Water Wind and Sun. His plans don't even include biomass or any type of heat engine except geothermal. If you go to his website and look at his staff leadership---it includes a "creative director" and a "producer." I think he is more about publicity than facts. James. Thank you. Happy New Year to you and your family. I always love to see your name on a comment. Scott, I appreciate this. Once again, Blogspot annoys me by not bringing the links over in a comment. Your links are important! So, I will try to bring them over myself by hand-doing the html link. Here goes. Hope it works. It would seem that in the US north, a great percentage of buildings use natural gas direct heating. This actually makes sense. Economically speaking, if your goal is heat, it makes far more sense to heat space by directly burning natural gas, than to use natural gas to generate electricity - because, of course, as you know (since you have been in chemistry and energy issues for a long time) you have to burn 2 to 3 times as much gas to generate the electricity to produce equivalent heat to directly burning the natural gas. But, it also raises another important point - 1) If we are to seriously cut greenhouse gas emissions in the country, we need to move to heating by a combination of clean electricity and, possibly, geothermal energy (that is, electric geothermal heatpump systems); 2) The ONLY source of electricity that is reliable enough in the winter to make sure that people don't freeze, is nuclear. Wind and Solar are just too unreliable to use for heat in the northern US, Canada, etc. So, if for no other reason, we should build nuclear for clean electric heat in the winter. . . and use the electricity for other purposes the rest of the year (I think we can find ways to put the electricity to use ;-) ).